With the festive season fast approaching, buying intentions are high, so too is the competition. Whether you’re a wine retailer or an online hamper company, a farm shop or a convenience store, Christmas is relevant, and is all about getting those incremental sales. A customer may only walk in to your store for a bottle of wine, but there is no reason why they shouldn’t leave with a beautifully wrapped bottle in a gift bag, inspired with ideas. Use our 4 top retail tips below as a checklist to help you maximise your sales this festive season. Effective signage allows you to quickly communicate messages like price, special promotions and product information to customers without saying a word, and you’d be surprised how many customers are put off by having to ask for a price. We’ve learned a thing or two about gifting over the years. By focusing on a smaller range of proven bestsellers you can offer a tight range of gifts at various price points, minimising stock and maximising sales at this crucial time of year. Know your customer and what they will pay. Break down the cost of each component noting the cost price of the contents and what you can sell it for. 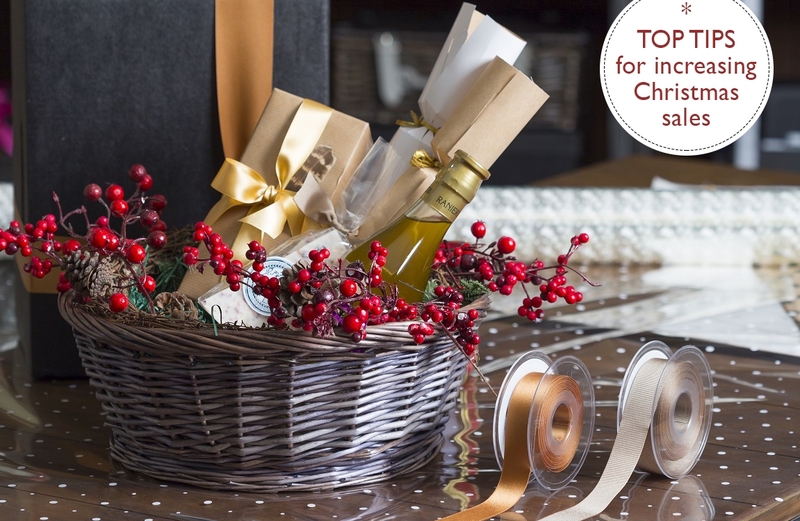 Then use packaging to create a minimum of 3 pre-made gifts at different price points. Start with setting up a dedicated gift display table in store that showcases your gifts at different price points. Display ready-made hampers and gifts at a variety of price points within eye-line of your customers, and you may just inspire them to leave with something more than they came in for. Don’t forget about the area around your till. Take example from the big retailers such as Tesco and Lidl, who have spent millions on customer research and shopping trends, and place low cost add-on Christmas purchases such as gift bags, wine accessories and even ribbon in the final leg of a customers journey. They are guaranteed to increase those add-on sales this Christmas. Offering an enhanced level of customer service can have a significant effect on your business. Consider offering a gift wrapping service, ‘free’ for items above a certain price point purchased in your shop. It’s a great way to offer excellent customer service, and will not only increase sales but will have customers coming back time and again! These Christmas tips are super cool. I am gonna follow them this year.